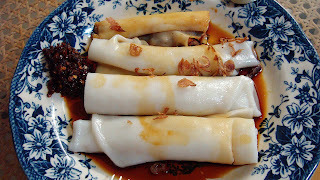 Made Chee Cheong Fun some time back and took me quite some time. I've only got one steaming tray and I have to repeat many times. And I also like it while it's still hot. Ended up, we both stand and ate by the stove after every batch is out. Made the sauce and the batter the night before. The following day is all about steaming only. I'll be trying out a microwave version soon that does nto require wheat starch or any hard to come by corn flour. Stay tuned! This recipe is adapted from Sinner of The Waitakere Redneck's Kit. Mix the rice flour, wheat starch and corn flour together. Add water slowly and stir continuously. Strain it once and add in the oil and salt and mix thoroughly. Set batter aside for at least an hour or overnight would also be alright. Heat up the steamer with an oiled shallow tray placed inside. When the water comes to boil, ladle and spread a thin layer of batter onto the hot tray. Steam for about 4-5 mins on high. I only steamed mine for 3mins each for a small 8'' round layer, probably less tahn 3mm thickness. Remove the plate from the steamer and use a scrapper to roll up the chee cheong fun. Garnish with a generous drizzle of the sweet sauce (recipe below), fried shallots, roasted white sesame seeds and store-bought chili paste along the side. Mix all ingredients together in a small pot and cook over medium flame until slightly thick. I love Tim Sum and chee cheong fun is of one my choice. But lazy to make. cookinggallery.blogspot.com ~ she likes to make Tim sum too, maybe you would like to pay her a visit. Thanks Anncoo for introducing me to the blog. I love dim sum!! !